The Generic Names Supporting Organization (GNSO) is a policy-development body which is responsible for developing and recommending to the ICANN Board substantive policies relating to generic top-level domains (gTLDs). 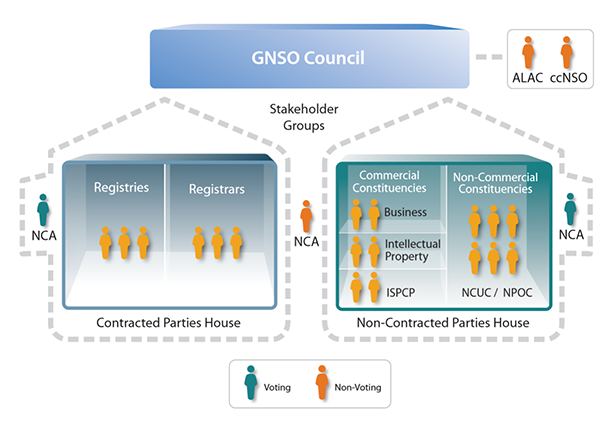 The GNSO is formed of Stakeholder Groups, themselves composed of Constituencies, which together form one Supporting Organization to form consensus, set policy, and make evidence-informed recommendations. The GNSO was previously known as the Domain Name Supporting Organization (DNSO), which it replaced in 2003. Policy development within the GNSO is governed by the GNSO Council. The Council meets 12 times per year; four times face-to-face (three times at ICANN public meetings, and once at the Council Strategic Planning Session), and eight times via webinar. The main objective of the GNSO is to ensure that gTLDs operate in a fair and orderly manner across the global Internet, without hindering innovation or competition. As ICANN sets policy by contract, the GNSO develops policy with the involvement of both the contracted and non-contracted parties who hold equal influence and equal voting rights. In addition, two independent appointments to the Council of non-voting members are made by ICANN's Nominating Committee. 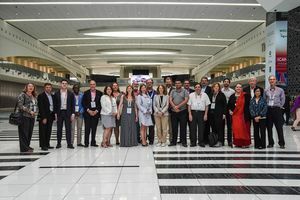 GNSO Council, as photographed at ICANN 60 in Abu Dhabi in November 2017. The GNSO Council consists of 23 members, 20 of whom are voting members; they come from a variety of different regions and represent the aforementioned Stakeholder Groups and Constituencies involved in ICANN's multistakeholder model. Heather Forrest is its current chair. The GNSO is the primary engine within the ICANN community for developing, recommending changes, and making modifications to generic top-level domain policies. The GNSO aims to identify ways to improve the inclusiveness and representativeness of its work while increasing its effectiveness and efficiency. An important GNSO improvement was the development of recommendations for the new GNSO policy development process. The ICANN Board launched a set of recommendations for improving the effectiveness of the GNSO in June, 2008. These recommendations were related to GNSO activities, operations and structure. The Policy Development Process (PDP) Updates are one-page documents prepared by ICANN staff to inform the Governmental Advisory Committee (GAC) and other interested parties about potential opportunities to engage in and contribute to on-going GNSO PDP efforts. They are published on a regular basis and translations of these can be found on the GAC website. Please, also refer to our GNSO Policy Briefing for information on these and other GNSO activities. In September 2012, ICANN senior executive Kurt Pritz sent a public email to GNSO Council Chairman Stephane Van Gelder advising him that URS implementation could begin after a year of delay. Implementing URS included a pair of open meetings in Fall 2012, including one at ICANN 45 in Toronto. ICANN acknowledged the role played by the GNSO Council in developing and approving the model and said they were willing to "work in whichever way the GNSO wishes to proceed". ↑ URS Implementation Finally to Commence Under GNSO Direction. Internet Commerce Association. Published 2012 September 20. This page was last edited on 5 February 2019, at 23:02.